Minor League Player of the Day: Bakersfield 3B, Juan Silverio, went 5-5 for the Blaze. On the season, Silverio is hitting .278/.297/.443 with 12 homers. He’s 22 and in his 3rd year in High A, playing the last two for the White Sox in Winston-Salem. With “The Greatest” visiting before the game at Louisville Slugger Field, the Bats looked like Jerry Quarry. 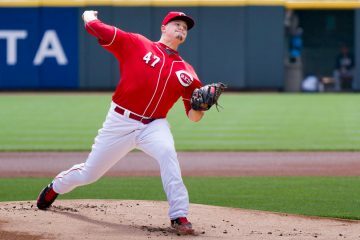 Chad Reineke had a nice start going…until the 6th, when an error by Billy Hamilton and a string of hits (and bad relief pitching by Kanekoa Texeira) killed his stat line. He threw 5.1, allowing 6 runs (4 earned) on 7 hits, a walk, and 2 strikeouts. Texeira posted a pitching line of 2 IP 5 H 3 R 3 ER 0 BB 1 K (and allowed two of Reineke’s runs to score). Nick Christiani threw 1.2 hitless innings, walking one and striking out 2. Southern League All-Star Shaun Ellis started and threw 4 innings of 2 hit-shutout baseball, walking 2 and striking out 3. The bullpen held the Bears hitless the rest of the way. Parker Frazier picked up the win with 3 innings, walking 2 and striking out 3. Chris Manno threw 2/3, and Trevor Bell picked up his 8th save with an inning of work. Josh Ravin threw 1/3, but walked two. Ryan LaMarre went 2-3 and Chris Berset went 2-4 with a double. The Blaze jumped out to an 8-0 lead, then held on to win. They were led by Juan Silverio, who went 5-5. The only other Blaze hitter to have more than one hit was Kyle Waldrop, who went 2-4 and hit his second inside the park homer of the season (16). Junior Arias also homered (2). James Allen got the win with a strong start, throwing 5 innings of 1 run baseball. He did give up 7 hits and 2 walks, but struck out 7. Kyle Lotzkar (.1 IP 3 H 3 R 3 ER 1 BB 1 K) and Ben Klimesh (1.1 IP 3 H 2 R 2 ER 1 BB 2 K) let Lake Elisnore back in the game, but Jimmy Moran threw a scoreless inning and a third and Pat Doyle picked up his 7th save with a scoreless inning. Seth Mejias-Brean started the inning with a homer (2-4, 9th) and Beau Amaral capped a 6 run 8th inning with a grand slam (2-5, 8th). SS Zach Vincej went 3-4. Sal Romano stared and went 5.2, allowing 2 runs on 5 hits and 3 walks, along with 6 strikeouts. Joey Housey picked up with win with 1.1 hitless innings (2K’s) and Alejandro Chacin notched his 2nd save with a scoreless 9th. Jon Matthews continued his recent hot streak, going 4-5. Carlos Sanchez was 2-4. The Reds jumped out front 7-0 and never looked back. 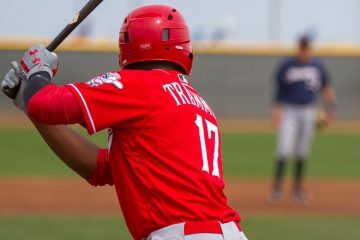 Aristides Aquino went 2-5 with a double and homer (2), Kevin Franklin went 2-4 with a double, Jose Fernandez went 2-4 with a triple, and Kevin Garcia went 2-5. Nick Routt started and went a hitless inning, walking 1. Manuel Aybar got the win, going 3 scoreless innings, allowing a hit, a walk, and striking out 2. Jesus Parra threw 1.2 hitless innings, Ibrahin Redan threw a hitless inning (1 K), as did Wagner Gomez. Who is this kid Seth Mejias-Brean? Seems like he is tearing the cover off that ball in Dayton. Did the Reds draft him in the late rounds recently and get lightening in a bottle. I know he’s young and its A Ball. But a promising start to a pro career. What happens to Greg Reynolds, now that he has been DFA’d?? Certainly, he won’t make it through waivers. A side note: The Pirates are on the verge of acquiring the Twins 1B Justin Morneau. Hope this falls through. He would make the Buccos a little stronger.